We have 5 immaculately maintained and well equipped holiday caravans for hire. Each caravan has its own raised deck area with patio furniture where you can relax, listen to the birds singing and enjoy the wonderful countryside views and breathtaking sunsets. Our static holiday caravan hire weeks run from Friday to Friday, but mid week breaks and weekend breaks are often available. We are open all year. Please contact us for availability. We welcome well behaved pets (no dangerous breeds). 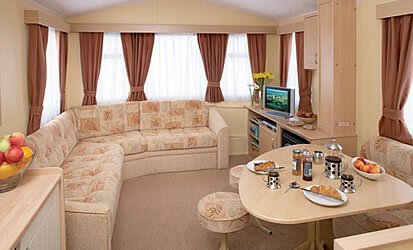 Each of the 4-6 berth static caravans on our Holiday Park offers comfortable spotlessly clean accommodation. All are fully equipped to ensure you have the most comfortable holiday possible. Open plan living and dining area with gas fire and colour TV / Freeview. Well appointed kitchen, refrigerator, microwave and full oven and hob. Double bedroom and secondary twin bedroom, both heated (the lounge area provides extra beds if required) ï¿½ shower room with toilet and wash basin. Outside there is a large decked area with table and chairs for you to enjoy a meal or simply a quiet drink. 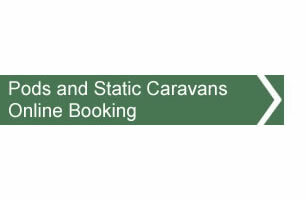 See opposite for the typical layout and interior of our static holiday caravans. Linen and towel bales can be hired leaving you with nothing to bring but yourselves! Lovely site, beautifully clean and well kept. Great to hear the birds with wonderful country side all around. Bus stop 10 minute walk from the site and the local shop is by the bus stop. Very peaceful. Hi, we camped at your site last week and just wanted to say thanks for a perfect week and let you know that you have the most beautiful site with the cleanest facilities we have ever experienced. We stayed at seven different sites on the way but none of the others came close to yours.